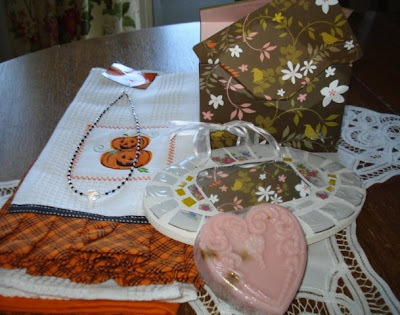 The items are: a handmade mosaic china mirror, handmade Rose Delight soap with embedded rose petals, handmade necklace made with Swarovski crystals, pretty little postcards (with envelopes) in Fall colours and a set of 3 Halloween kitchen towels. If you'd like to join as well, just click on the picture above and it will lead you to the giveaway rules and mechanics page at Cranberry Blossom. nice giveaways....wish you the best of luck dear!